Yesterday, Kotaku sourced a report from Asahi.com that mentioned that the six Representative Directors at Nintendo (Miyamoto included) received a million dollars. The original wording was somewhat unclear as to whether that was for all of them or each. According to Nintendo, it was each. Nintendo has released a detailed report showing how much those six Representative Directors earned last year, including base salary and bonuses. As previously mentioned, Nintendo President Satoru Iwata made ¥187 million (US$2.09 million) with a base salary of ¥68 million ($760,000). The rest of his pay was bonuses — this holds true for all Representative Directors. Nintendo's Senior Managing Director Yoshihiro Mori made ¥110 million ($1.24 million) with a base salary of ¥44 million ($497,000). Fellow Senior Managing Director Shinji Hatano was paid ¥114 million ($1.6 million). Hatano's base salary was ¥48 million ($542,000). Another Senior Managing Director Genyo Takeda earned ¥110 ($1.24 million) with a base salary of ¥44 million ($497,000). While Nobuo Nagai, a Senior Managing Director, also earned ¥110 ($1.24 million) with a base salary of ¥44 million ($497,000). In 2009, Miyamoto's salary was ¥126 million ($1.4 million), making him currently the second highest paid Nintendo employee. His base salary last year was ¥60 million ($678,000), which is the second highest base salary in the company. The average salary for execs at Japanese companies is around ¥25 million ($280,000) a year. Part of Miyamoto's image is that he's just a regular guy! And that he doesn't take a larger salary than other employees, as website Giant Bomb put it, "in order to prove an equal to his fellow designers". This is, as we now know, incorrect. He is the second highest paid Nintendo employee. 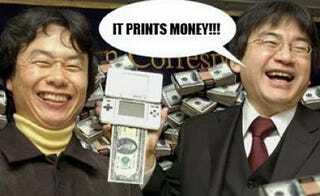 In a 1999 interview with the Daily Telegraph, Miyamoto stated, "Nintendo only pays me a salary. So why don't you in your article ask everyone who has enjoyed my games to send me 10p to my account!" What a difference a decade makes. Miyamoto doesn't need it. He should send you 10p. Compared to what singers, actors and pro athletes make, Miyamoto is certainly worth every penny yen Nintendo pays him — and then some. The idea that he is not being properly compensated for his work, however, is just not true. The reason why his salary, previously secret, has suddenly been made public is due to changes in Japanese law. Starting March 31, a new regulation now requires Japanese companies to disclose the salaries of employees over ¥100 million (US$1.1 million) — much to the chagrin of corporate Japan. Executive salaries in Japan are lower than the astronomical compensation execs receive in the West. "Companies owe their existence to society," says Shizuka Kamei, the Japanese politician who spearheaded the regulation. "People who are paid a lot should be proud of themselves and the job they do." Miyamoto should certainly be proud of the work he has accomplished. He hasn't only changed video gaming — he continues to do so. Update: Nintendo financial documents also show that Shigeru Miyamoto has 100 shares of the company. Satoru Iwata, on the other hand, has 4,800 shares.